Welcome to the Prenatal Yoga Center! Welcome to our thriving community and the beginning of your journey into motherhood. Our staff and teachers are dedicated to providing you with an exceptional yoga experience. We look forward to seeing you in class soon! We do not preregister any of our prenatal, postnatal, or Baby & Me yoga classes at the Upper West Side studio. Please plan to arrive 10-15 minutes early before taking your first class. 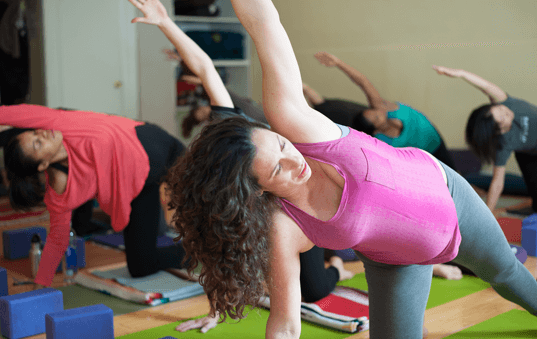 New prenatal yoga students are welcome to take any class on our schedule and then decide whether to put their first class towards a class package, or purchase a single class. If you prefer to continue as a drop-in student, after your first class, you will be limited to our Saturday classes. Please note that all students may opt to take drop-in classes at full term, generally after the 37th week of pregnancy. New to the Prenatal Yoga Center? Complete your new student paperwork before you come to class! Click here to fill out the waiver online, and then just sign in when you get to the studio. Your account will already be active in our system. At Prenatal Yoga Center, we have developed each class using our unique three-pronged approach to prenatal yoga. Highly trained and educated instructors cater to the anatomical, hormonal, and muscular changes which occur normally in the pregnant body by creating sequences which lessen discomfort so students feel better after each class. Classes also preparing the mother both physically - specifically with focus on proper pelvic alignment - and mentally for birth whether that be medicated, natural or cesarean. We start each class with “circle time”, a time where the women introduce themselves, say how far along they are, and discuss any aches and pains they would like to address in class. Pregnancy and postpartum periods carry such enormous physical and emotional changes;and this bonding time creates a springboard for long lasting friendships among students. 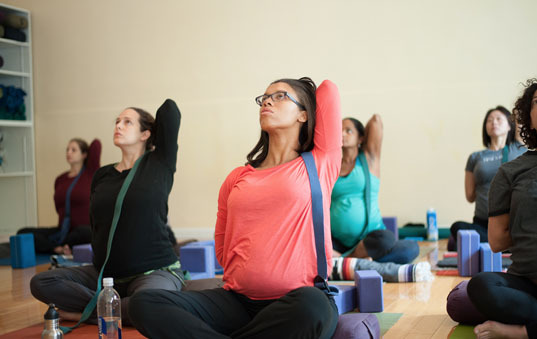 Through a regular weekly practice, prenatal yoga can help reduce stress, ease the common aches and pains of pregnancy and develop useful pain management and breathing techniques for labor and delivery. To help you find your path into a regular practice, we have developed several options for class packages and series. Valid for 31 consecutive days. You may suspend your pass for your postnatal period – we’ll restart it when you are ready to return. Two week extension does not apply to the monthly unlimited. If you come twice a week, that is just $22 a class! We offer a variety of workshops including Childbirth Education, How to Breastfeed, Caring for Your Newborn, Infant Massage, and more! Please note that workshops do require pre-registration. Do not come on an empty belly! Prenatal students should eat a light snack approximately 1-hour before class. Mats and props are provided, no rental fee. If you would like to use your own personal mat, feel free to bring it along. Strong perfumes and heavy jewelry not recommended. For caregivers and babies: Please note we are up a one floor walk up, and there is no elevator available. We are happy to assist you up the stairs with your stroller!